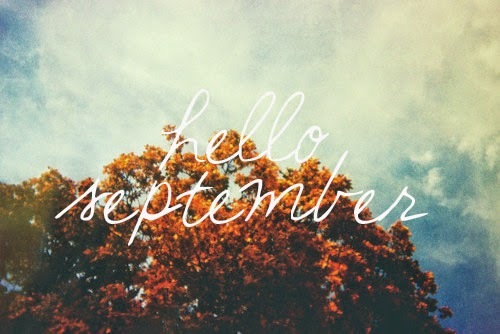 I love September, it's probably my favorite month. It stems from my childhood when we used to go back to school. I used to love the anticipation of going into a new class, a new school year, getting to use all of my new pens and pencils, my perfectly neat and clean school books in my bag in order of size ready to be used. I was a neat freak about those things. It's still a story that gets told by my friends how particular I was about my pencil case and it's contents in primary school. (all of the pencils pens, ruler and rubber had to be lined up perfectly!) I used the same school bag for my last 4 years of school, you know one of those Jansport bags that were all the rage once. It had badges from Kerrang! stuck on the front and a Winnie The Pooh key ring on the zip. I had saved up my babaysitting money in 1st year to buy one myself because the Mother said they were too expensive. I proudly went into Mahers Sports in Cork city and got it just before starting 2nd year in the September. I remember excitedly getting my school uniform out and ready the week before we would go back to school, all my copies would have my name on them ready to be filled in once the school year kicked off. I would painfully mark my school journal with all of the important dates in it like birthdays, the Christmas GAA disco, the school holidays, I might even add in some school notes. Of course it was also compulsory to get everyone to sign your journal too, the more covered in people's signatures it was the better. September signals the end of the Summer, a time for the routine to come back and the adventures of the Summer to wind down. I crave routine and loved the security of it during the school year. It was a time to knuckle back down to some hard graft with homework and all that. I love how throughout the month of September the warm weather begins to fade and by the end of the month Autumn has slipped in and it's time to start putting that jumper back on. The carefree ways of the Summer months with the sun are no longer. In my job, working in student accommodation I still have the same kind of experience. We see the busy Summer period ending and we start to slow down. We no longer have to work weekends or longer days and once we have all of our student heads on beds we can breathe a sigh of relief that another Summer season is over and a new academic year is beginning. There's new faces to see and we are 9 to 5er's once again. September tells me that Winter is on it's way and this is my favorite season. It tells me that there's lots of cosy night's by the fire coming, that we will have stew for dinner again to keep us warm on those cold days, that I can start to bring the scarves out maybe even buy a few more from Penneys to add to my collection, get the coats out of the cupboard and stock up on the teabags, nothing like a nice warm cuppa on a cold day. As much as I love the Summer months with all the lovely weather, different events and activities, bbq's, late evenings with lots more daylight, bedtimes that are later than usual, leaving the back door open all evening and hearing the kids playing outside until 10pm, I also love the calmness that comes in September when everyone is back at school, the holidays are over and and there's a stillness in the evenings as the days get shorter. For me this year September also means that I go back to a 4 day working week which gives me an extra day at home with Luke, an extra 24 hours to watch him grow, to cuddle with him on the couch, to go on adventures together, to find some puddles to splash in, some leaves to crunch on and this is what I'm really looking forward to. There is just something about September that makes me breathe a sigh of contentment.